NOTE: Caul fat or lace fat is the membrane that encases the intestines of pigs, cows or sheep. It melts when cooks keeping the dish moist. 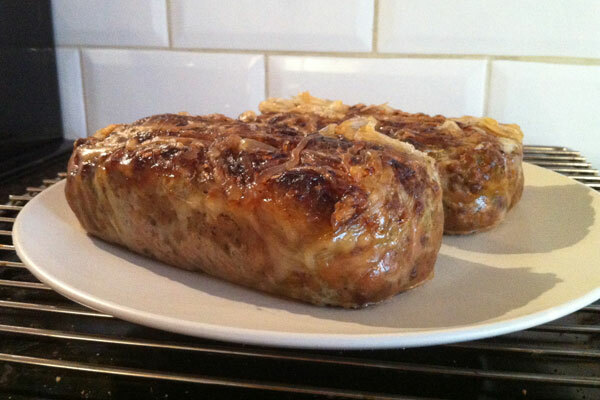 As well as haslet it is also used in the preparation of faggots and can be used as a sausage skin. It is quite hard to find these days so, as an alternative, you can prepare this recipe using baking paper to line the tins and grease with a little pork lard. This meatloaf recipe is a traditional Lincolnshire dish made with pork belly and pigs liver, opinion is divided on proportions but roughly 50/50 is a good place to start. You can substitute the liver for more pork mince if preferred. Herbs and spices are a matter of preference but sage and mixed herbs will be found in most traditional recipes and you can experiment with others to achieve your own personal favourite combination. Nutmeg, allspice, chilli and cayenne pepper all work well. Serve with bread, crackers or salad or cut thick slices for a main course served with potatoes of any kind.